AMAZING SALE - This home is stuffed with high-end EVERYTHING! Beautiful decorator furnishings, bedroom sets, beds. 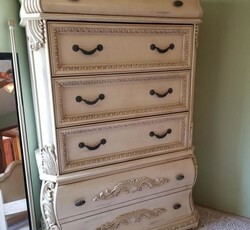 dressers, armoires, dining room sets, sofas, settees, chairs, magnificent hall piece, stunning baby grand player piano, art - decorator and signed pieces, office items, kitchen decor, dishes, antiques, glassware, collectibles, baby furniture, highchair, stroller, pack n play, bicycles, 4 wheelers. Motorcycle and gear, numerous guitars, has powered hobby car, lawn furniture, designer label clothing, purses and shoes. Estate jewelry. Tools and trinkets. INCREDIBLE SALE!